I'm going to spend the month of May posting flowers. Definitely one of my very favorite things. Some may be considered weeds by some but I like to think of them more as wildflowers. I hope to like them. I love these. Are they fragrant? 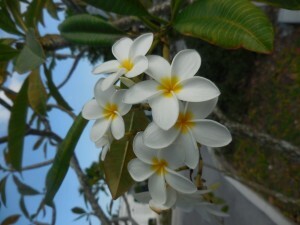 Very fragrant. In Hawaii they are used to make leis. We call them (free translation) Temple tree. I have another picture of the flower in yellow.